The first project from my midwinter rummage sale haul last weekend to be upcycled is this dated wooden display board with heart cutout. First I painted it with DecorArt Americana Chalky Finish Paint in Primitive. I applied two coats. Next, I painted a round wood applique made by Darice Artistic Appliques. I first brushed on craft paint in Walnut Noyer, and then Annie Sloan Chalk Paint in Old White. I sanded the plaque edges and the applique with 220 grit sandpaper to lightly distress it. I nailed on the wood applique to cover the heart cutout. I then applied Decoart Creme Wax to seal the chalk paints. I still don't know what this nail plaque was originally intended to display, with its two rows of flat nails, spaced fairly closely. I tried to place a spool of thread over the flat nail head but it was too big. 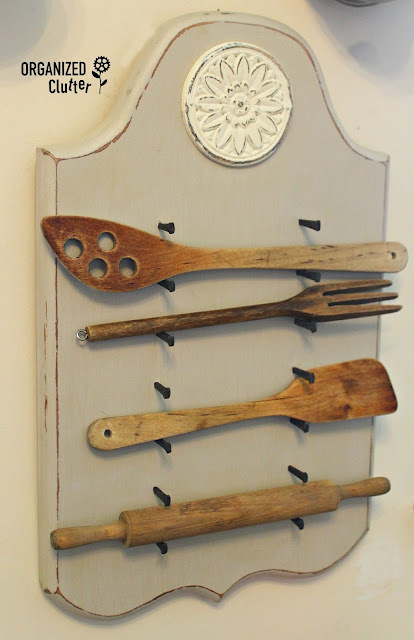 I am going it to use it display vintage wooden utensils. 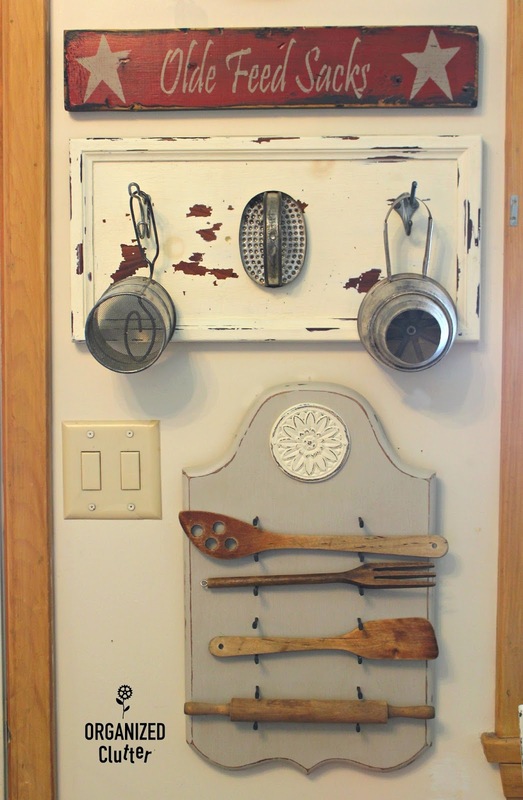 Nothing says farmhouse kitchen like old utilitarian kitchen ware. The Darice Artistic Applique is available at Hobby Lobby. The base coat and wax used in my project are available at Amazon and at Home Depot or Hobby Lobby. That turned out great, Carlene...so smart to use the applique to cover the heart! I have a couple of favorite shelves that have the heart cutout. This really dates decor pieces, and I love your idea using the applique. I have been trying to think of ways to cover them. You've come up with a neat way to display the old utensils. Like it! Amazing idea! It turned out perfect. Enjoy this week. I love the applique. What a great way to recycle things I already have!! I love this wonderful display! Love the DIY! 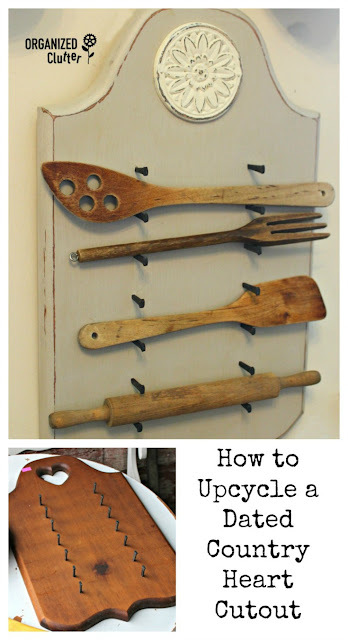 Nice display for the old wooden utensils. Really hard to figure out what that was used for. Smart move in covering up the cutout. I like the cutout you used too. Those cutouts used when "country" was popular are so common everywhere. I usually pass on them. You did a nice re-do with the applique. I really like it. Hmm, those nails...if spools of thread don't fit, I can't imagine either what they are for, but the utensils look nice.